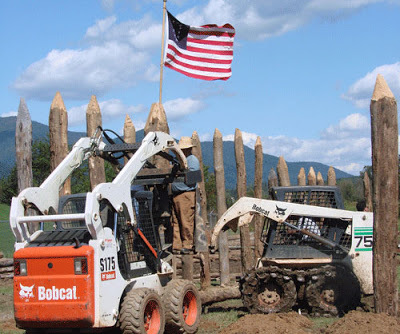 As we celebrated and honored our nation’s brave veterans this week, we were impressed to read the latest progress report from the Davidson’s Fort project. Davidson’s Fort was built by North Carolina colonial soldiers in their fight to gain independence from Britain during the American Revolution. It was the westernmost outpost and a base for a large battle against the Cherokee, who sided with the British. Davidson’s Fort is a significant piece of this area’s history and it gave the town of Old Fort, North Carolina, its name. The original fort no longer exists, but a replica fort is being built by dedicated volunteers as an educational venue and as a way to preserve the historical significance of Old Fort during early American history. The Fort is located about 15 minutes from the Inn on Mill Creek. The construction of the Davidson’s Fort Welcome Center/Block House has been a big focus for the past several weeks. Volunteers have been working diligently every Saturday to get the Welcome Center finished; the Davidson’s Fort folks hope to be able to have a community-wide Thanksgiving weekend celebration there, weather permitting. For anyone who will be in Old Fort this Saturday, November 14, the volunteers are having a “chinking” party on Saturday starting at 9am. 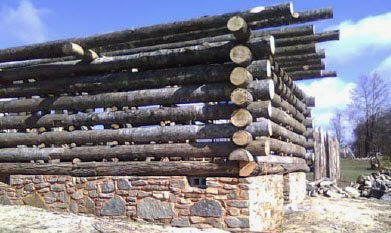 The Welcome Center is ready to be sealed by chinking in between the logs. No experience is necessary. For more information about the history of Davidson’s Fort (including a list of soldiers known to have served at the fort) and to read all the progress going on at the fort, visit www.davidsonsfort.com.